The first rendering is so sleek and sharp and perfect that I want to cry. But the artist’s second conception? 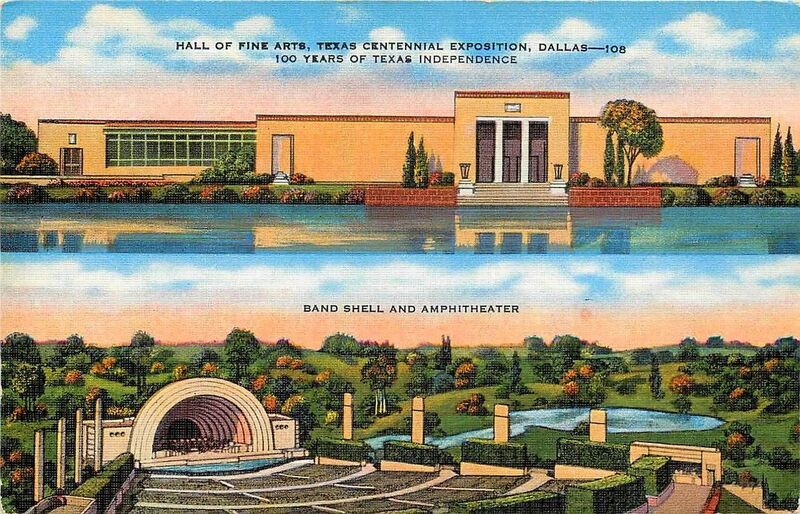 Well, now I know what the Fair Park band shell would look like plopped down in the middle of the manicured grounds of an English estate or an Italian villa (or maybe in the Clampetts’ backyard, out past the cement pond). …And it still looks damn good. The center of musical activity will be the open air band shell and amphitheater, a permanent feature of the Civic Center — seating capacity, 5,000 — the band shell accommodates 150-piece band. The most imposing structure in the Civic Center is the Hall of Fine Arts, constructed of Texas stone, cost $500,000, housing a $5,000,000 art collection assembled from all parts of the world. Click picture for much larger image.